The ORCA Hub architecture couples EPSRC core support with matching financial support from industry and innovation agency partners. It connects core research achieving Technology Readiness Level (TRL) 5 capability demonstrations of challenges derived from industry specified use-cases with partnership projects and other impact acceleration instruments involving SMEs, operators and the supply chain to de-risk further to TRL7 in the Hub. The focus of our demonstrations is guided by input from the Industrial Leadership and Opportunities Panel. The first ORCA Capability Demonstrations took place at The Underwater Centre in Fort William. 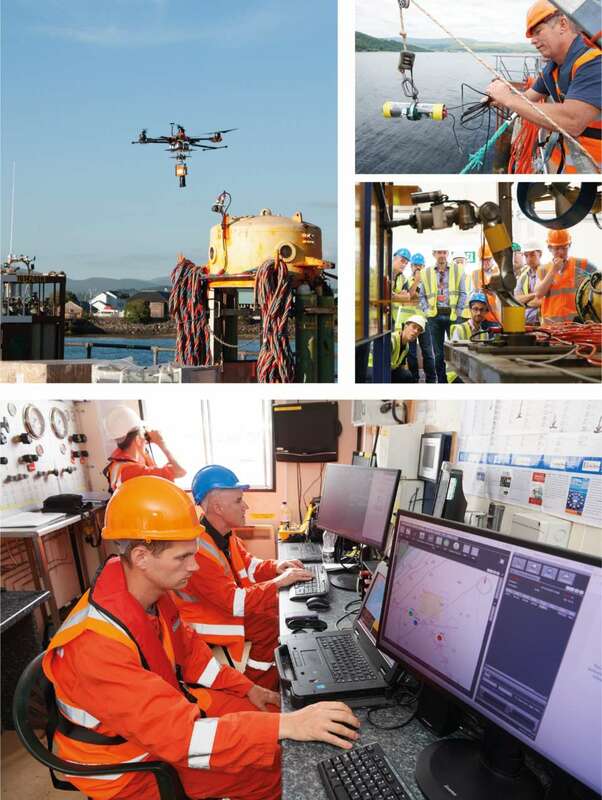 A demonstration day for industry partners was held on 2nd July to show developments from the project in the subsea and aerial domains which was attended by representatives from our industry partners. 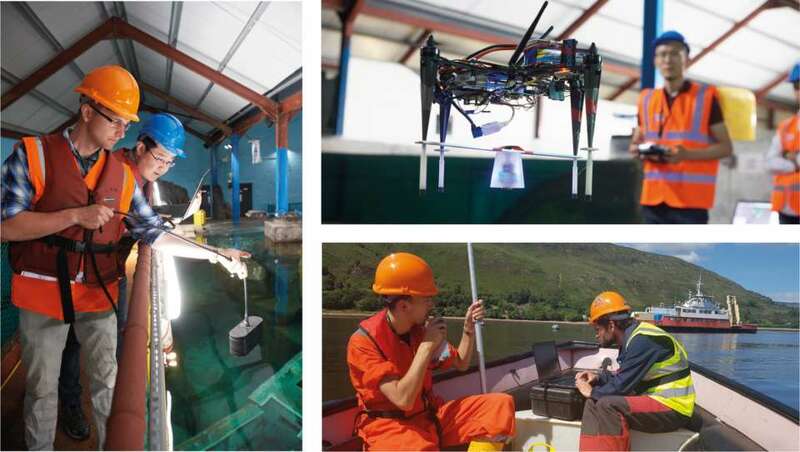 Prof. Yvan Petillot’s Sensing and Mapping team from Heriot-Watt University demonstrated an underwater sensor network on Loch Linnhe using the Sonobot and Iver3. The team deployed and localised multiple sensors and demonstrated inspections using cameras and sonar underneath the Loch. In addition, they presented updates on their collaboration with the University of Girona focussing on autonomous manipulator robot-arm force control that is safe and robust to environmental disturbances in the subsea domain. On the Human-Robot Interaction side of the project, Dr. David Robb took the lead in testing MIRIAM (Multimodal Intelligent interaction for Autonomous systeMs) using real autonomous underwater vehicles (AUVs) for the first time by linking in with Prof. Petillot’s demonstration. MIRIAM provided mission updates, warnings and behaviour explanations for real missions in natural language. In the indoor tank facility, Dr. Sen Wang and Dr. Tomasz Luczynski demonstrated the use of stereo cameras for 3D visualisation and navigation underwater. Dr. Adam Stokes’ research group at the University of Edinburgh also participated in the trials to test out developments to their Limpet sensor. Their work focused on testing the Limpet’s ability to use its sensors while submerged and assessing how it could use acoustic communication to communicate with other underwater nodes through the USMART system. Dr. Chang Liu and Dr. Pouyan Khalili from Imperial College London, whose work focuses on autonomous aerial robotic operations in relation to offshore inspection, provided an aerial demonstration to show a small drone placing a sensor onto a specified point. They also placed a sensor onto the pier using a large drone launched from an offshore vessel. The feedback we’ve had from the industry partners so far - they can see the real application for some of the research that’s being done. Really fantastic progress. 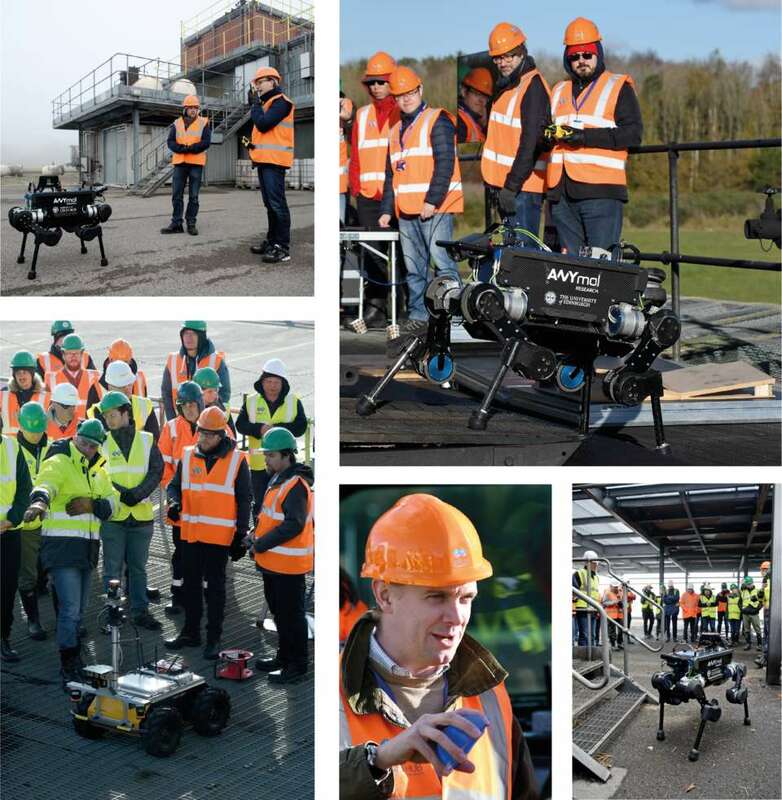 Over 50 research staff from across each of ORCA’s partner institutions participated in the second ORCA capability demonstrations which focused on terrestrial and aerial activities. A team was invited from the University of Oxford to represent our sister Hub, RAIN (Robotics and AI in Nuclear Research) was also invited to take part. We were delighted to have strong attendance from industry, in addition to our EPSRC representative and the Independent Steering Committee Chair. Out at the College’s oil rig site, human-robot interaction lead, Prof. Helen Hastie from Heriot-Watt University gave attendees an indoor demonstration of a scenario showing MIRIAM providing emergency response to an unmanned aerial vehicle (UAV) which was inspecting a fire on an offshore oil rig in a simulated environment. 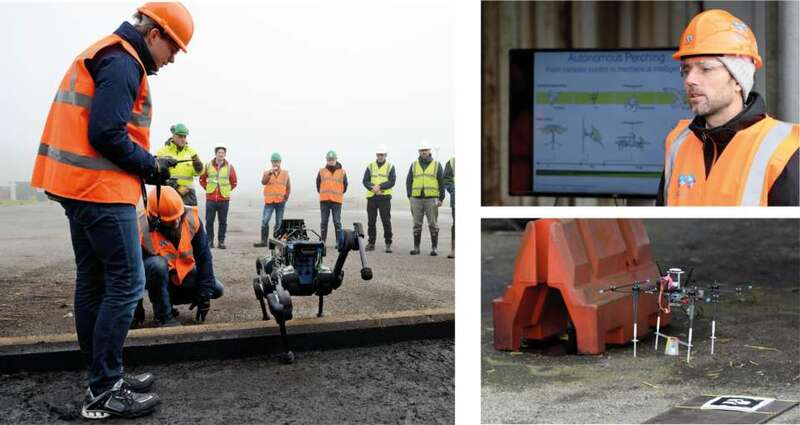 At the rig site, the University of Oxford team showcased their Dynamic Robot Systems (DRS) research on legged mobility for inspection using the ANYmal quadruped and a remote operation software stack which allows the operator to supervise the progress of the mission and plan the robot’s next actions. Starting at a distance from the oil rig, ANYmal demonstrated its ability to localise its position relative to a prior 3D model of the environment, after which it was tasked with reaching a target area inside the rig. This involved navigation across uneven tarmac and the traversing of a 25cm barrier for which the team inverted its leg configuration. The team then used a speedy trotting gait to reach an industrial staircase which it climbed using a walking gait before entering the rig to explore. The University of Edinburgh team led by Dr. Michael Mistry gave their ANYmal demonstration showing semi-autonomous sensing and intervention with mobile robots by manoeuvring ANYmal around both seen and unseen obstacles on top of the rig where it also had to contend with different challenging surfaces. Dr Adam Stokes and his group from the University of Edinburgh discussed the further developments of the Limpet sensor. Future demonstrations will include communication from the Limpets back to a central station and show their monitoring capabilities either through showing real-time data or adaptable edge processing. Dr. Chang Liu and Dr. Pouyan Khalili from Imperial College London gave demonstrations of autonomous sensor deployment using a large drone to carry the sensor from ground level to land on a specified point on top of the rig. Using manned aviation practice as inspiration, the University of Liverpool team are working towards demonstrating the use of distributed simulation that can be used to generate evidence to help certify both offshore assets and the assets that gather the data themselves. Led by Dr. Mike Jump, the Liverpool team demonstrated the progress that has so far been made including an initial distributed simulation example. Colleagues from the RAIN Hub at the University of Oxford demonstrated a repeatable autonomous inspection routine using visual teach and repeat on a Husky wheeled robot on top of the rig. This was followed up with a demonstration of long-term inspection planning under hazardous conditions using a Jackal wheeled robot autonomously navigating around the base of the oil rig.